How to get there: This description is from the city of Trento (north of Venice along the main Autostrada A-22 going north to the Brenner pass). 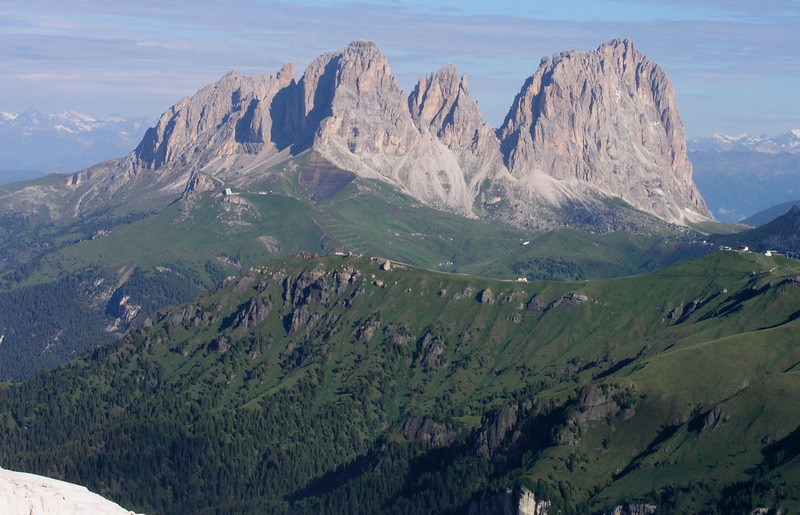 Alternate access from the city of Bolzano further north, as well as from the winter sports villages Cortina or Val Gardena. From Trento, drive to the village of Canazei (1463m). The quickest way is north along A-22 to exit Neumarkt Egma, then east following signs to Cavalese. The road actually bypasses this village, follow signs for Moena and subsequently Canazei. Driving time is 1.5 hours without any delays. An alternative road is to go north directly from the center of Trento on road SS-12 for about 7km to the village of Lavis. In Lavis, take the road to the right that has signs for several villages up the valley. This road will connect with the previous route in Castello. This route is shorter, stays in the same valley, but the road is quite narrow (single lane) in places and passes through many small villages. Charming, but not for a quick access. Driving time is about 15 minutes longer. From Canazei, continue through the small villages of Alba and Penia, then uphill until reaching the dam of Lake Lago de Fedaia (2055m). Turn right here and drive across on top of the dam to find parking on the opposite side near/at Rifugio Seggiovia. Marmolada is towering above. 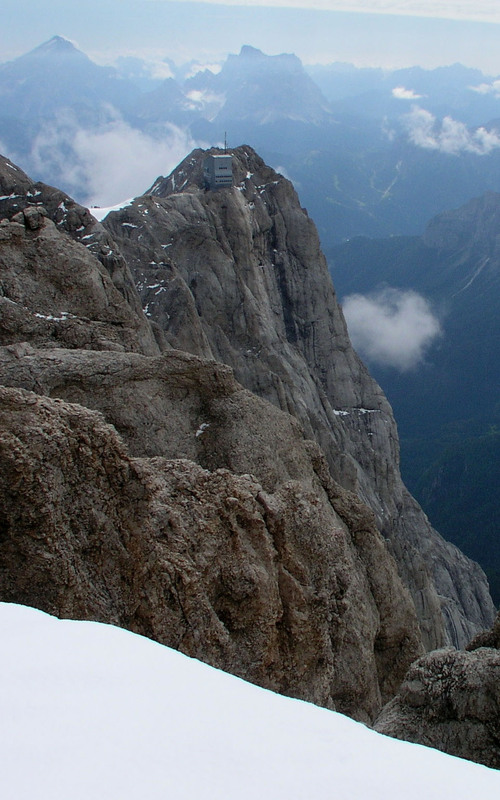 Alternatively, one can reach this pass on a good mountain road from the resort town Cortina. Route description: 3. (successful) Attempt, July 17. 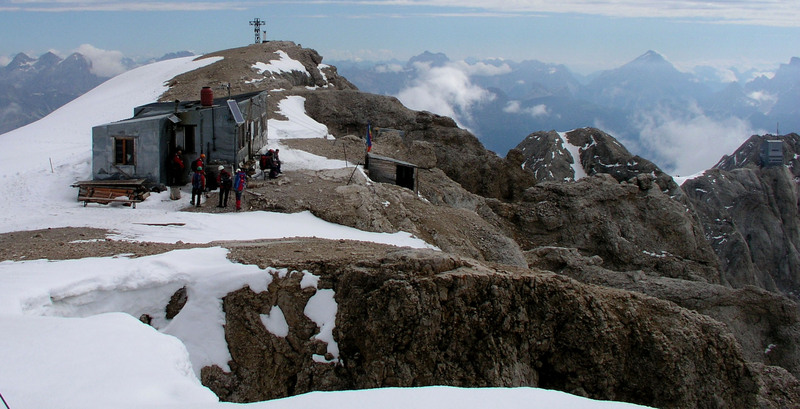 2004: One can either start from Rifugio Seggiovia or take the lift from here to Rifugio Pian del Fiacconi at 2625 meter. The trail connecting these two is straightforward, but adds about 1.5 hour to the trip. 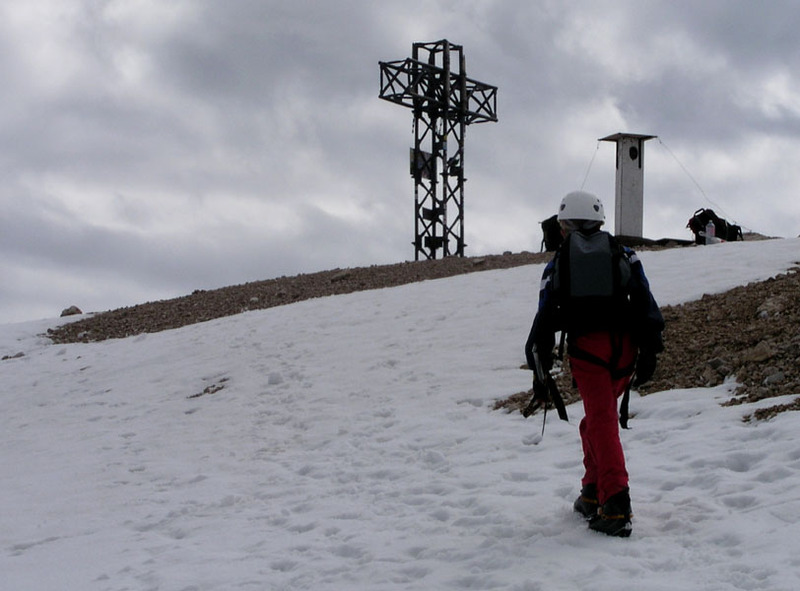 Under stable weather conditions a hike from the bottom makes most sense, however, with unsettled weather the lift may save some time and increase the safety of a climb. From the top of the lift, take a moment and look at the mountain. The main glacier towers straight uphill. A very distinct valley with rock on both sides, but filled with a glacier is just to the right. The route heads into this glacier. Viewed from below, one will notice an initial gentle section, then a somewhat steeper hill followed by another gentle section with yet a steeper section higher up. Ascend the correct glacier as described above. 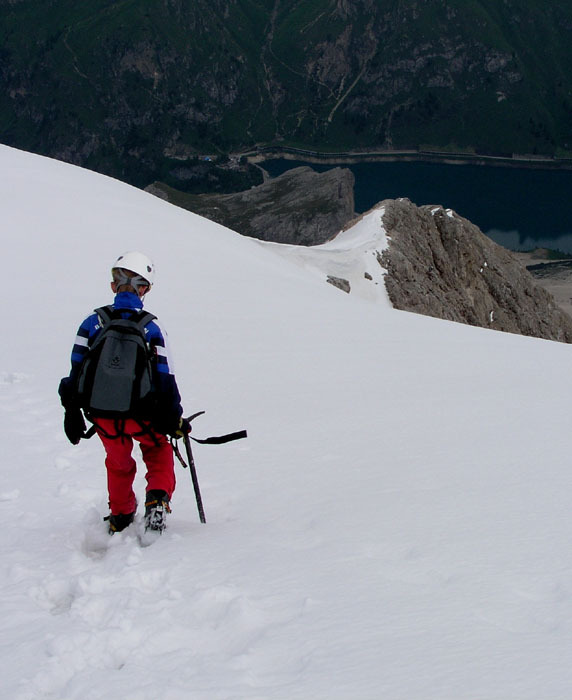 The slope is not very steep, with normal summer snow one may prefer to walk without crampons. 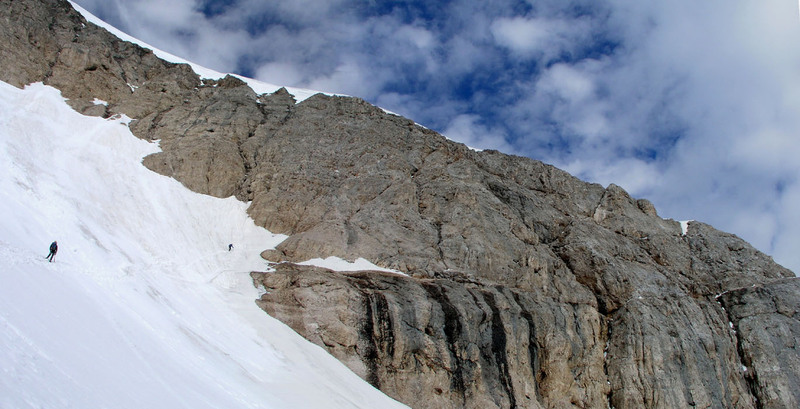 After the initial slightly steeper section, there is a second section that may have more crevasses near its top. The angle of the slope and the crevasse situation are likely better if one stays on the left part of the glacier. After this second increase in slope steepness, the route heads right in order to connect to the rock part of the climb. From further down, one may identify this point by following what looks like a pretty straight rock ridge (or possible ramp) downwards until it connects with the snow. There is a picture below showing this more clearly. The rock route follows a single line of fracture (a distinct crack or very tiny gully), from the snow and all the way to a point very near the end of the ridge above. There are good holds, but the rock is pretty smooth and rounded full of knobs. The climbing is a very sustained (YDS) class 3 in difficulty, a stretch of about 200 meter. 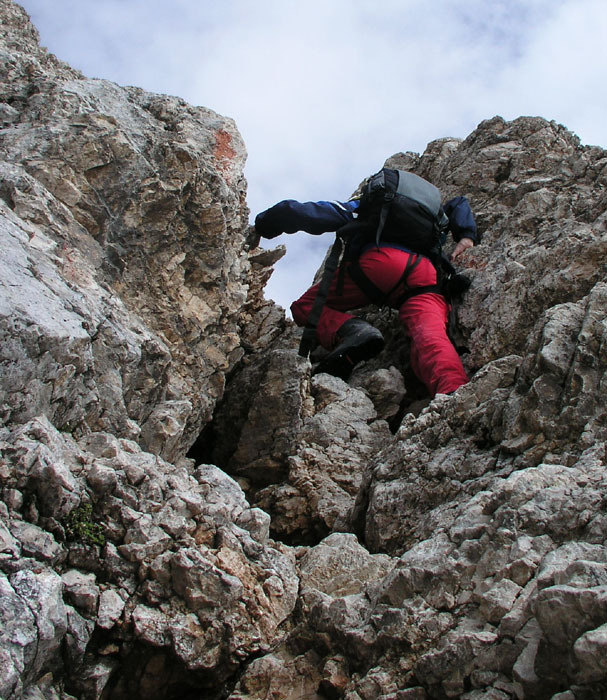 Nearby terrain is class 4, the easiest route stays inside the crack all the way. There is absolutely a sense of exposure, the difficulty may border on class 4 in a couple of places. The rock part ends at the tip of a snow ridge. This ridge (seen from above) is fairly narrow at the start, but it gets broader higher up. 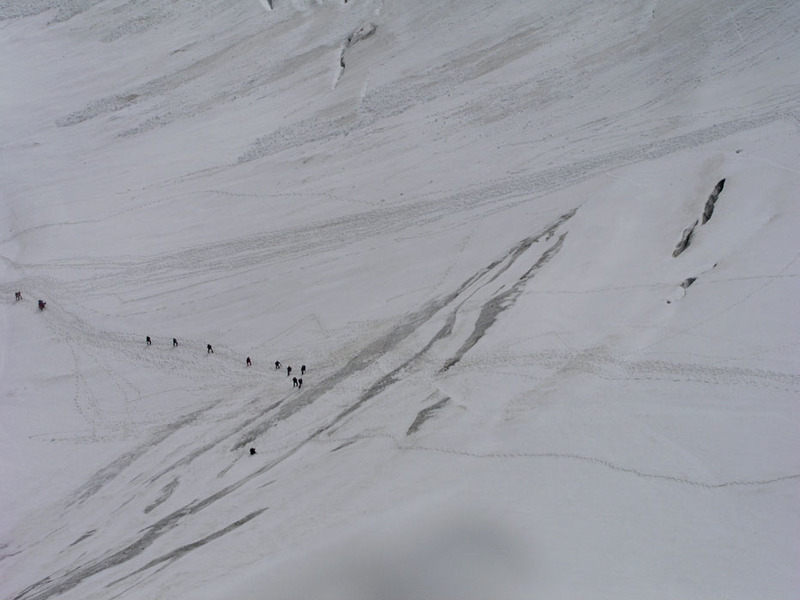 There is a sense of high mountain as you see other climbers still on the glacier below you. The best route stays to the left while ascending this ridge. The snow is never steep and this part of the route is pretty straightforward under normal conditions. 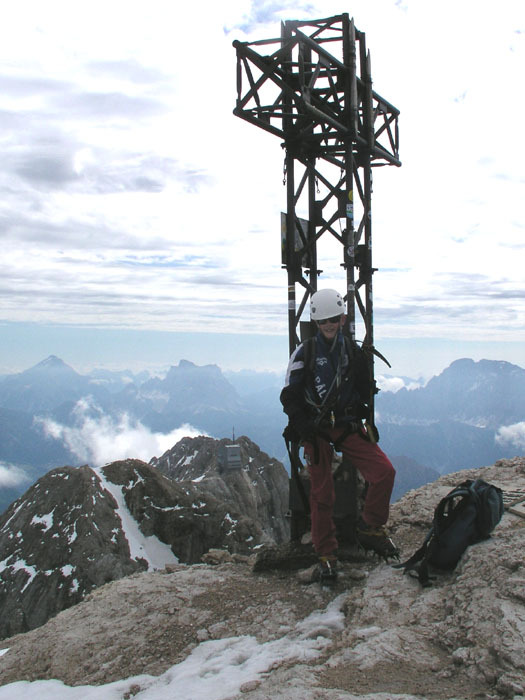 Soon, the summit cross is visible to your left and a well deserved break on the highest point in the Dolomites is called for. From the summit, the top ridge stretches west with a small shelter about half way. Looking east, you see Punta Rocca (3250m) that I climbed in 2003, it is clear that any traverse from there to here is beyond what normal people do. Descend the same route. Incomplete from 1. Attempt, March 29. 2003: This is incomplete since I did not get to the summit along the proper route. However, this information may still prove useful as I certainly understand this mountain much better after this hike. 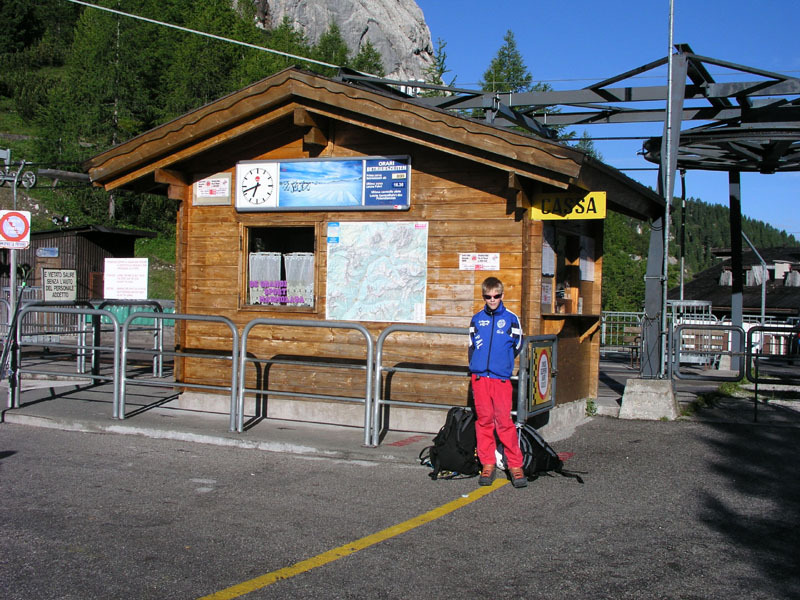 If the lift from Rifugio Seggiovia (where you parked) is operating, then take this. At the date of my hike, the lift started at 0830 and a roundtrip ticket was 7 Euro. (After my experience with soft snow from the day before, the trip down should not be forgotten.) The lift ends at Rifugio Pian del Fiacconi at 2625 meter. Take a careful look at the mountain slope in front of you. I find the local map hard to read (as compared with Norwegian maps). There is a distinct glacier (valley) going up slightly to your right. The rocks on the right side of this "valley" are very pronounced on the map, but the left side is less distinct (on the map). In the terrain, this "valley" is quite distinct, one MUST stay to the right (and below) the rock points that are visible on the glacier towards the horizon. As it is a glacier, parties should be three or more and travel roped. As early in the season as March, travel is likely quite safe, but skis may be needed. 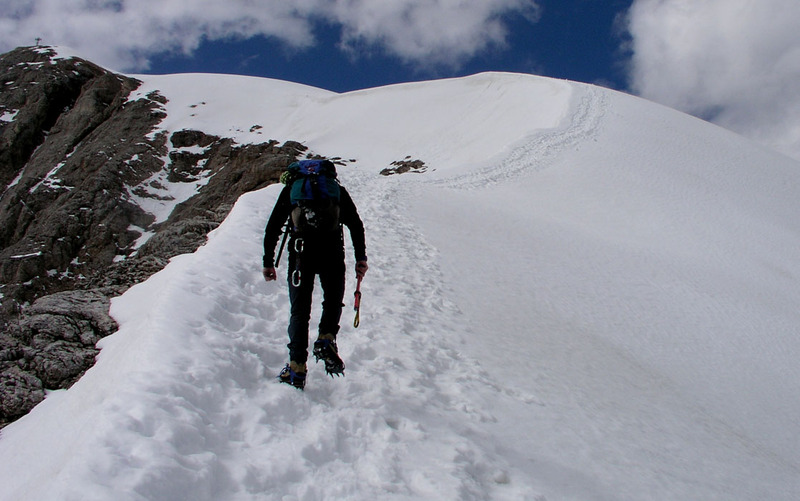 In March, all tracks and footprints headed straight up and slightly left, this is not the route to the summit of Marmolada. 1. Attempt, March 29. 2003: This attempt ran into a couple of problems. I left Trento at 0600, had breakfast in Canazei at 0730 and got the first ride with the lift at 0830. As soon as I started hiking, I did notice that there were no traces or steps leading in the correct direction. Moreover, the snow did not support me, so I fell through as soon as stepping outside old tracks. After the experience from the day before (see Piz Boè, 3152m), I was essentially allergic to this kind of conditions. Indeed, skiing conditions, not suitable for hiking. The fact that this route crosses up a fairly steep glacier that certainly has (hidden) crevasses did not increase my enthusiasm for conditions where you fall through the upper snow with little or no warning. I decided to follow a track that was already made and where the snow therefore supported my weight. Unfortunately, it became pretty clear that this would take me to Punta Rocca (3250m), also the top of another gondola coming from the east side (Malga Ciapela, 1450m). 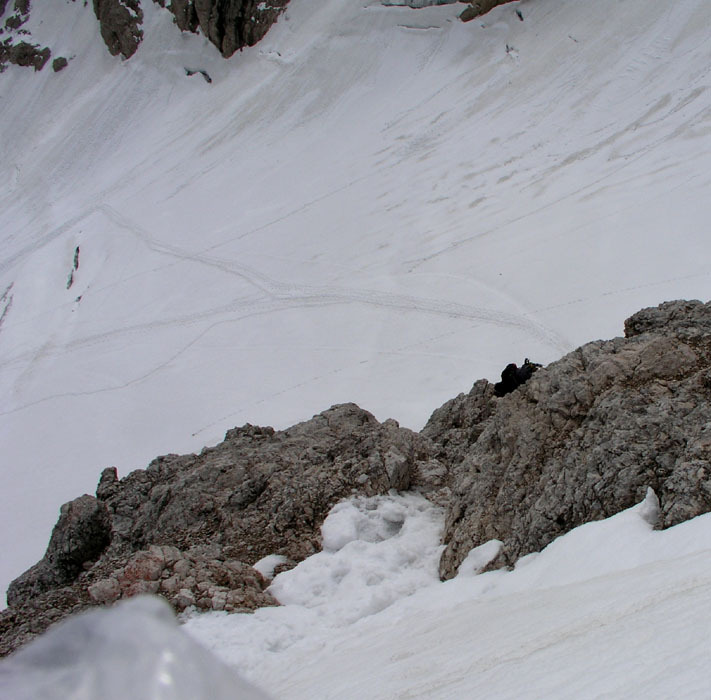 I decided to check if there was a traverse route from this point to the base of the summit of Marmolada, also called Puenta Penia. Due to bad contours on the map (they are inconsistent) this was not clear. For some reason the local maps skip contours and despite being scale 1:25.000, it is hard to make proper judgement of terrain steepness. The top ridge from the gondola station towards a higher, local summit was nice with spectacular drops to the south. I explored a possible traverse on the north side of this summit with the intention of getting back to the proper route, however this slope was steep and a roped belay would have been in order. Looking at the same area from below supports the conclusion that one should climb into this glacier "valley" from below, not trying to traverse into it from the top ridge. Big clouds started to accumulate around the summit and it started snowing. It had taken me approximately 2 hours to hike up, I enjoyed the summit ridge as well as exploring the route west for another hour. The descent back to my lift took slightly less than one hour and I was back by the car around 1300. 2. Attempt, July 15. 2004: We arrived at the refugio located at near the dam of Lake Lago de Fedaia on July 14. After dinner, we went to bed early in order to make an early start the next morning. I checked the weather around 0600, the entire Marmolada wrapped in clouds, new snow on the ridges. No way, we could even consider an attempt this morning. 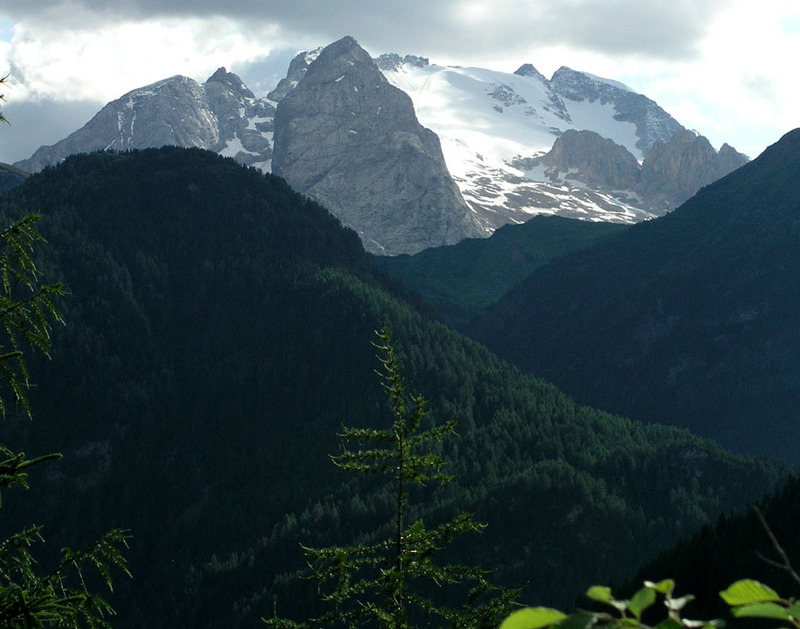 We gave up the attempt right away and headed towards Trento in search of information about the prominent peak Dodici. Just as we left the base of Marmolado, it started raining. This just reinforced our decision to move out of the area and look for better luck elsewhere. 3. Attempt, July 17. 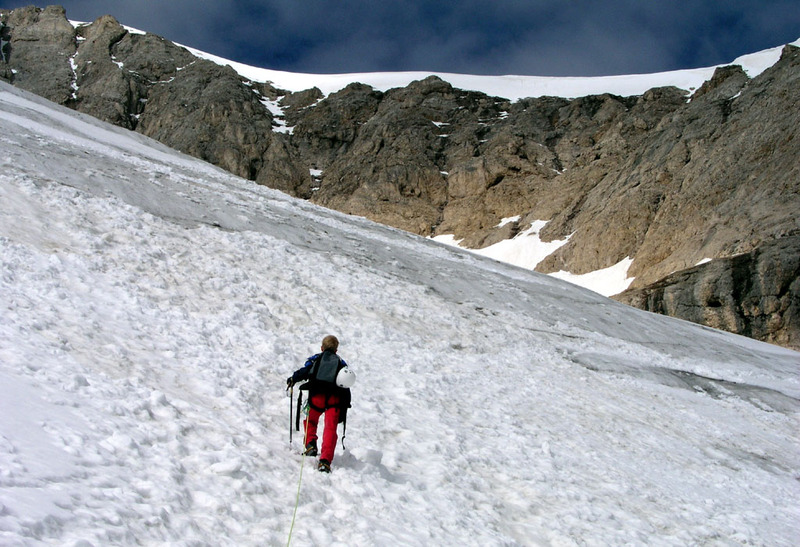 2004: I did this climb with my son Pål Jørgen, age 15. After a successful climb of Dodici, we returned to Alba, a small village beyond Canazei on July 16. If the weather improved, or at least not deteriorated, then we were determined to make a third attempt on this summit. Pål Jørgen and I arrived at the base of the lift from the village of Alba, around 0730. Clouds and thunder had been present fairly early the day before, in order to maximize the good use of the morning hours we had planned to use the first lift in the morning around 0800. We started on a 15 meter light rope, Pål Jørgen leading, at 0850. Several larger rope parties ascended the glacier above us, having started from the refugio, but headed for the ridge further east. A first visitor could easily take the wrong route by following, assuming that the parties ahead indeed were going for the summit. Pål Jørgen started out with a murderous pace and despite crossing a couple of glacier crevasses in a steeper spot than strictly necessary, encountering a short stretch of blue ice, quickly caught up with other parties. We were soon at the start of the rock climbing, Dad breathing hard from the rapid ascent. We unroped at the base of the rock and proceeded independently up the rock and further along the snow ridge to the summit. Arrival at the summit at 1020, a smashing 1.5 hours only. While we rested, an Italian man (that we had passed on the way up) pointed to Pål Jørgen and said "Forca, Forca", clearly impressed with his high altitude, uphill speed. We enjoyed the good weather, fine panorama views and lunched for about 30 minutes, then headed down and reached the refugia around 12 noon. Shortly after we left the summit, it was all engulfed in clouds. 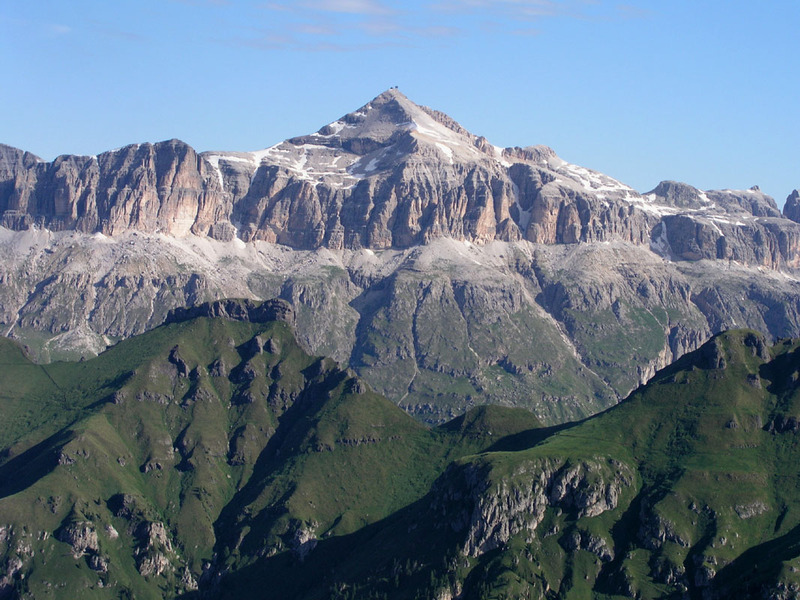 Several parties arriving later, thus missed the exceptional view that Marmolada offers. The next day, we dedicated to Via Ferrata, by climbing Colac. Marmolada, July 14. 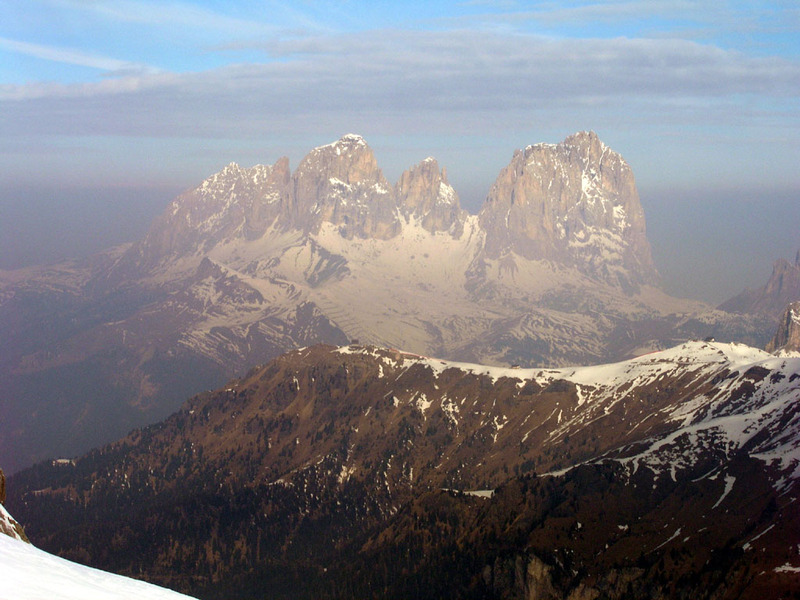 2004, on the way from Cortina. Marmolada, July 14. 2004, evening picture. Marmolada as seen from below on the north side. 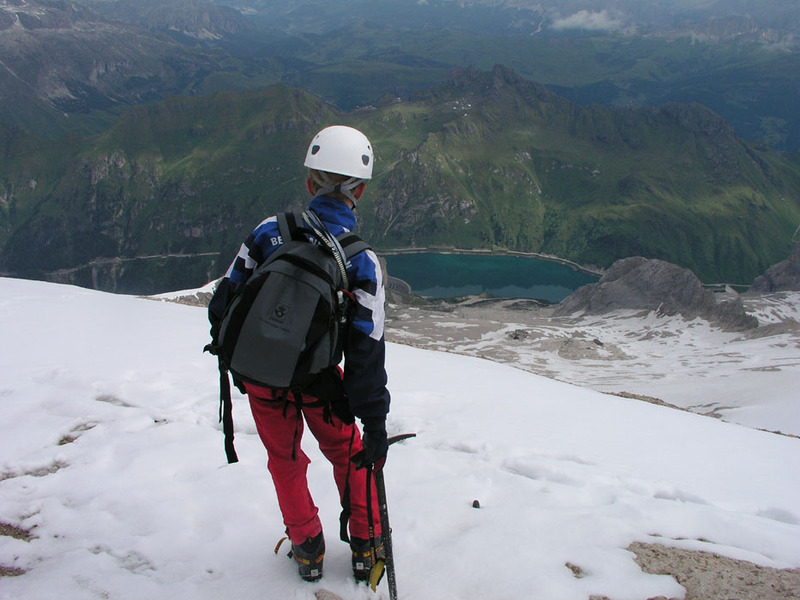 View west while climbing on the Marmolada glacier. 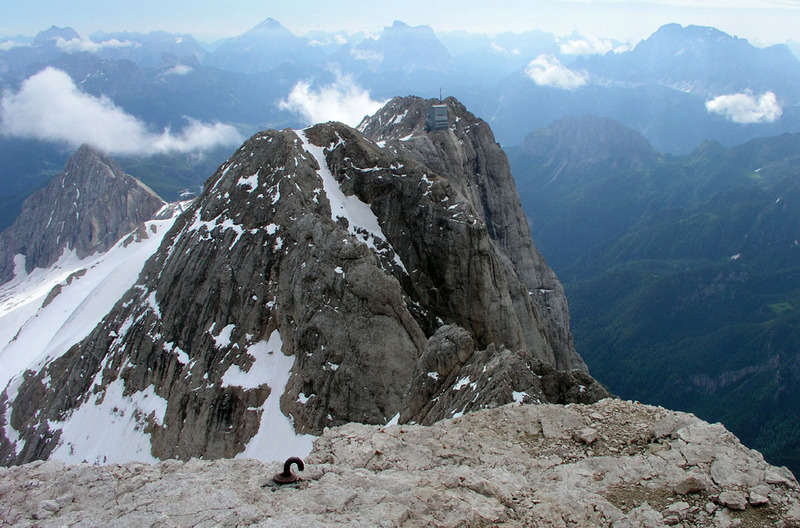 Plattkofel and Langkofel as seen from Marmolada. 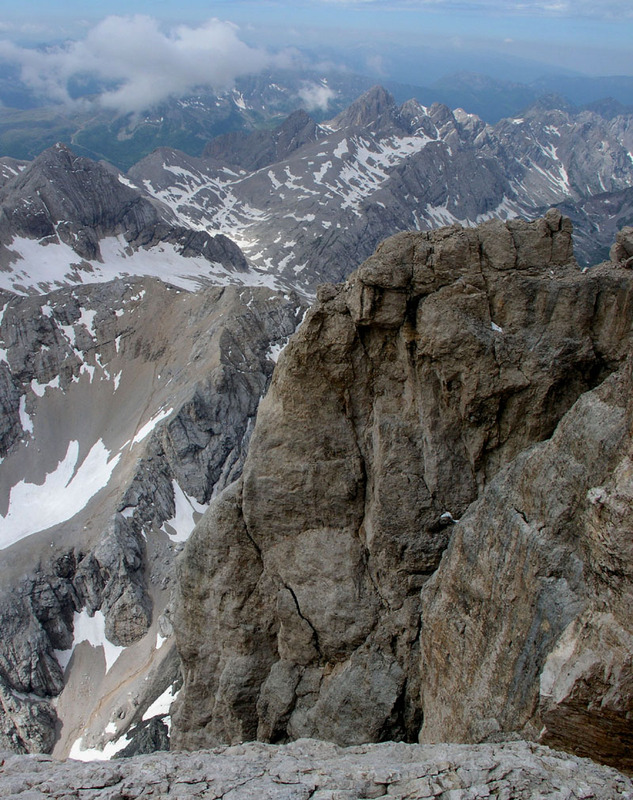 View south from the top ridge (Puenta Rocca) east of the Marmolada summit. 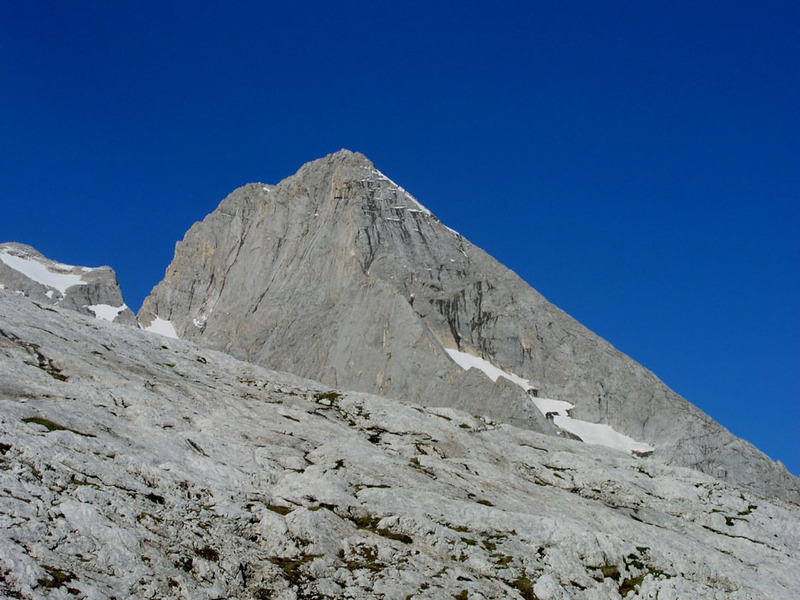 Roda de Mulon, 2882m, a western part of Marolada. The eastern part of Marmolada, as seen from below, a very clear morning. 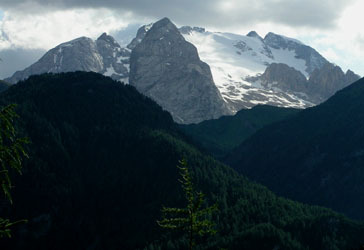 The Langkofel group, as seen from Marmolada. Piz Boè 3152m, as seen from Marmolada. 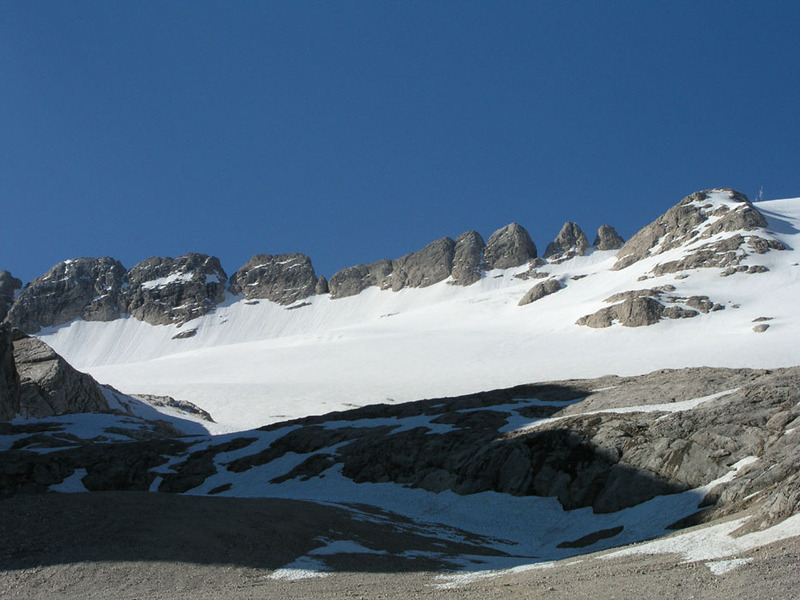 The top ridge from the west, the summit and Puenta Rocca is visible. Puenta Rocca, quite some location. The south face is quite impressive.